Pardon the puns as there are going to be a few but are you ready to dive in and discover the best gifts for swimmers! The ones that will make a big splash and really be appreciated by that lover of swimming in your life. In case you feel like you are drowning in the sheer depth available, we’re here to help you wade through the options and come up with the ultimate swimming gift guide. So let’s jump right in at the deep end and get this roundup off to a start looking at everything from changing robes to silicone caps, waterproof headphones to nose clips. We can’t promise that this is going to be the most glamorous gift guide ever, but for those of you who do have a friend or family member with gills and fins they spend so much time in the water, you could just make their day. Is it a towel, is it a poncho, is it a hoodie? Actually, it’s all of them and makes the perfect present for a swimmer or lover of surfing. 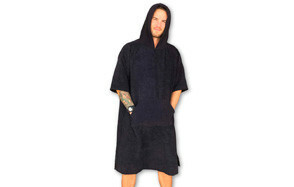 Whether you spend time around the pool or by the ocean, this stylish black, super comfortable microfiber toweling robe has got you covered. 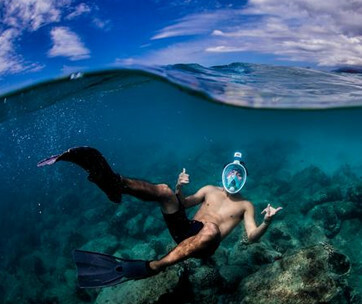 No more trying to find somewhere quiet or isolated to change out of your swimmers or your wetsuit. Throw the Breakers Surf Poncho over your head, and you can discreetly slip out of your wet gear while keeping yourself cozy, warm and dry at the same time. It’s thick and comfortable and comes with a convenient large center pocket that will hold plenty of essentials, and if the wind, as well as the surf, are up, you can protect yourself by putting up the hood. It’s fun, versatile, stylish and perfect for anyone who has an active lifestyle and is frequently in and out of the water or the changing room. Fully machine washable too, it’s quick drying and won’t pill so should look good for years to come. It’s our Best Choice product today, and it’s easy to see why. This may be a great stocking stuffer idea for your loved ones. If you have a water baby in your family who’s actually more like a little mermaid with all that long flowing hair, they are going to need a good swimming cap designed specially to cater for all that extra hair and this next product from Speedo does just that. OK, so maybe it’s not a Mermaid, perhaps it’s more like Poseidon, not a problem, the Speedo Silicone hat comes in 5 colors so is great for both male and females with longer length locks. It’s constructed from lightweight latex-free silicone and is durable but also a comfortable fuss-free fit. There’s extra space for longer hair to be tucked away conveniently inside the cap without compromising on the shape and fit, and it still creates a snug, secure feel that hugs to the shape of the head to improve those dynamics in the water. It’s available in a choice of black, blue, pink, silver or white and makes a great extra swimming related stocking filler gift for Christmas. No matter what your chosen sport, everyone needs a quality sports insulated water bottle and they always make a great extra gift idea. This Hydro Flask has a 21 oz capacity and comes in a range of really attractive and contemporary colors that are made from non-toxic BPA free plastic and 18/8 food-grade stainless steel. That bright powder coat finish doesn’t just look stylish and funky, it also has a slip-free grip and features TempShield insulation so that you won’t get any build-up of condensation. It conveniently keeps the contents piping hot or ice cold and has been thoughtfully designed so that it will fit comfortably in your vehicles cup holder, a bicycle bottle rack or just in your gym bag. That double walled insulation will keep hot drinks at the perfect temperature for up to 6 hours and cold beverages for up to 24 hours. It features a unique mouth insulated sports cap that lets you hydrate on the go, meaning you can just grab and sip with the one hand. Still looking for gift ideas for swimmers then how about our Premium Choice pick, these fantastic Underwater Audio swimbuds that fuse innovative audio flex technology with a fully waterproof design. They’re the perfect present for anyone with an active lifestyle who spends lots of time in and out of the water. The headphones include 4 different styles of interchangeable earbuds that should suit all tastes and preferences and have been created to deliver the perfect, secure fit. 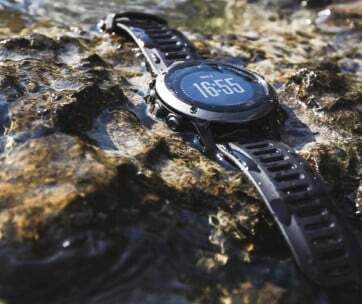 They’ve been designed to stay put whether you are a swimmer, runner, cyclist, surfer, wakeboarder or paddleboarder. They feature a short cord to reduce drag but come with an extension facility. You can choose from an ergo tip, tree tip, round tip or fin tip, depending upon your own personal in-ear comfort preference and there’s a range of sizes too. There will definitely be the perfect tip include in this set, no matter what the end users physiology or favorite water-based activity might be. Definitely a gift idea that a swimmer or swim coach will appreciate. Be sure to also check out our list of the best noise cancelling earphones for more great items like this. Up next we have a great swim gift idea from Nike in the form of their Swimmers specific backpack. Let’s face it, wet swim clothes are an occupational habit, so it does make sense to use a bag that has been specially designed for a swimmer’s specific needs. This comes in either Blue Graphite or Racer Pink, so it’s great for male and female swimmers alike. It features an insulated side pocket for storage as well as adjustable side pocket that is great for googles or water bottle storage. Internally there is a compartment that closes with an adjustable drawstring which is good for a laptop, and the whole backpack has been treated with a water-resistant PU coating. There are nice wide carry straps as well as a further chest harness for extra comfort and security. This Nike bag looks stylish, is really functional and would make a great swimmers gift idea. Our handy guide to the best running backpacks features more great products like this. If you’re looking for an inexpensive gift idea for your swim coach or for someone who spends a lot of their time at the swimming pool, then this Youphoria Microfiber Sports Towel could be a great option. It’s the perfect portable towel that you can pack into a bag and take with you swimming, camping, to the beach etc. and is ultralight and super fast drying. Just what you need if you are a frequent swimmer or are looking at gift ideas that a swimmer would appreciate. There’s a whole range of fun and attractive colors available and three different size options too. It’s compact and can hold up to fives times its own weight in water making it an excellent choice. It even comes with its own carry case and snap loop so that you can conveniently take it with you everywhere you go but also handily hang it up to fast dry after you’ve used it. It’s soft and super absorbent and has been designed from fabric specially produced to not create any mildew or odors after use. Great for swimming, yoga, the gym or for anyone with an active outdoors lifestyle. We have reviewed cooling towels as well, so make sure you check them out. These PQ Swimming Earplugs could be the perfect little Christmas gift for the swimmer in your life. 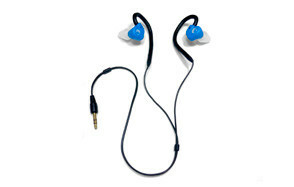 They’re a super soft and skin friendly pair of earplugs that should fit most ear sizes. Once securely installed inside the ear canal, they should stay in place without you having to worry about them being dislodged. They’re made from a special silicone that is designed to be reusable and come in their own carry case so that they can be stored away safely when they’re not in use. With protective undulated barriers, they won’t fall out but better still, nothing can get in either, so whether you are in the pool, surfing or water skiing, not water or dirt will be able to enter your ears. An inexpensive but guaranteed to be appreciated gift idea for anyone who spends time in the water. Anyone who is remotely interested in swimming will be familiar with the Speedo brand, and these Vanquisher swim goggles are actually award-winning, receiving accolades in both 2017 and 2018 as America’s Most Recommended Swimming Goggles. They’re made from PVC and are latex free and are an excellent, competitive level pair of goggles that feature corrective lenses. What that means is that they come with your choice of custom dioptre which has been designed to deliver superb underwater clarity, visibility, and a panoramic view. They also feature anti-fog as well as UV protection lens and come with 4 interchangeable nose pieces so that they deliver the perfect customized fit. They’re in a low profile, racing style design with a snug, corrective fit that makes them an essential tool for anyone competitive about their swimming. Available in both Adult and Junior sizes in a wide range of Diopters from -1.5 through to -8.0. Love this product? Fancy making a big splash this Christmas? The what about these Aqua Sphere Microfins that will turn anyone wearing them into Flipper, the dolphin, they will be able to glide so quickly through the water! They have been ergonomically designed to be comfortable to wear on the inside with a unique contoured foot pocket that allows for great transference of power from foot to fin. The blade length has been further constructed and carefully calibrated to deliver consistent and regular kicking tempo. All of that means that your action in the water is going to be far more efficient and less tiring. They also look pretty stylish too and have a superior grip so that you won’t be slipping and sliding all over the place when you get out of the water. These microfins would make a fun gift idea for a budding swimmer, diver and especially for anyone who’s keen to try out new snorkeling adventures on their next exotic vacation cause these can be used as snorkeling fins as well. A great gift idea for a swim coach or for anyone taking up open water swimming or about to compete in a Triathlon. This highly visible, bright orange inflatable buoy will ensure that anyone using it is easily identifiable and has that additional buoyancy protection that could be crucial out on the open sea. It’s super easy to use and compact too and is made from highly durable, long-lasting PVC. It quickly and conveniently inflates and deflates and is perfect for a whole host of water-based activities including kayaking, river crossing, and snorkeling as well as swimming in lakes, rivers, and the ocean. When not in use, it packs away in a dry bag which can also be used to store other personal items conveniently. Providing instant flotation support, it easily attaches via an adjustable waist belt. Kapsule 20L Swim Buoy could be a lifesaver and will undoubtedly provide a valuable element of safety, and security for anyone swimming in open water. The next entry onto our Gifts for Swimmers guide is our Best Value choice because the price, given the quality and dependability of the product, really is exceptional and a must-have for anyone who regularly swims. Coming again from Speedo so very much a brand you can trust when it comes to all things aquatic, it’s a lightweight and super flexible nose clip that comfortably contours to the wearer’s nose bridge. There are soft TPR pads that provide a tight rather than a restrictive fit, and while it only comes in one size, it should pretty much fit all. A care box is included, and there are three color choices so you can go for Blue, Charcoal or a Clear design. 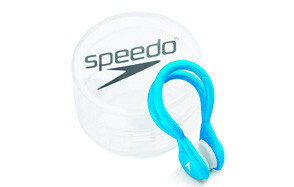 For its superb performance, fit and feel, this Speedo Liquid Comfort nose clip will take some beating. A great little idea for a present for a swimmer or a swimming coach to have as part of their essential arsenal of poolside training equipment. Used by both professionals and recreational swimmers alike, this Kickboard is excellent for immobilizing the arms and isolating the legs for advanced and targeted lower body training. It’s constructed from a durable and long lasting closed cell EVA foam and measures in at 20” x 11.5”. TYR Kickboard is the perfect training aid for a competitive swimmer looking to improve their leg technique or for anyone just looking to support various aquatic exercise routines. Water aerobics anyone? You might joke about webbed fingers with the avid fan of swimming in your life, but with this Speedo Aqua Gloves, they really can make like a fish! This Neoprene training glove has been specially designed with a webbed finger design and rubber palm to increase propulsion through the water and is fantastic for developing water resistance and strength. It has a fully adjustable wrist closure so deliver a secure and dependable fit while being soft and comfortable to wear. If you know a lover of water aerobics or water-based upper body workouts, then this is a great gift idea. It’s great for toning and strength and adds an extra element to water-based activities. Finally today on our Gifts for Swimmers review we have a pair of Nemesis Contour Paddles from Speedo that has been ergonomically designed to improve the technique of the wearer in the water. These fitness paddles are great for swimmers of all levels and really help to assist with push-pull mechanics in the water. The contoured shape means that they are more comfortable to wear and the tubing straps on the fingers and wrists have been improved to deliver more flexible security. These paddles also feature Tubercle technology which provide the wearer with smooth pulling trajectory and the ability to have greater control. Choose these Nemesis fins for the ultimate water workout.